This winter, ACT students have been empowered to express themselves through Abstract Painting with Becky Baker. For nine weeks, ten individuals have met for our Abstract Painting class on Tuesdays. Throughout the sessions, students have been given opportunities to explore various styles, emulate artists like Rothko & Mondrian, and play around with perspective. The group has created a variety of pieces from landscapes to textured impressions. Despite the dreary midwinter days, the studio has filled with color and warmth. From the smiles to the content created, it is clear the class is well liked. Around the room each, some students are meticulous, taking small, meditated strokes, so they don’t blur the lines that break up the geometric shapes on their page. One student, Ray, walks into class with a sparkle in his eye. One evening, on his small canvas, he traces an “s” shape with bright orange, red, and yellow paints. During another class, his landscape, painted with a palette knife, features a prominent hill, with swirls of brown, yellow and black that meet the sky. When complimented or asked about his work, he becomes shy, but eventually opens up. “Art is where I am smart,” he shared with a smile. 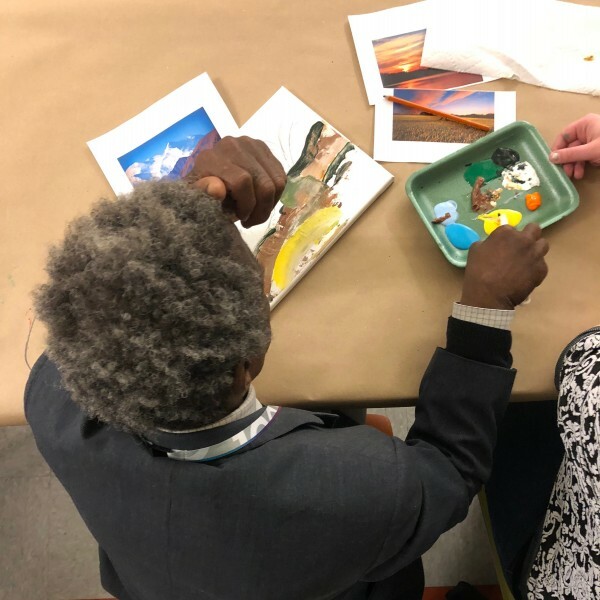 While they explore different styles and learn diverse methods, abstract painting gives students an opportunity to experiment with a variety of painting methods and styles, while giving them the freedom to put themselves and their individuality into each piece.